In 1956, while Ceylon was still on a lookout for a revolution in many fields, including culture, a boy of seven trailed behind the elders of his family until they reached the Regal Cinema balcony to watch the new film in town: Rekhawa. The boy’s aunt was in the cast. Sixty-two years later, the boy entered the same premises as the country’s Prime Minister. His aunt, Iranganie Serasinghe, a much revered actress, was in the audience. 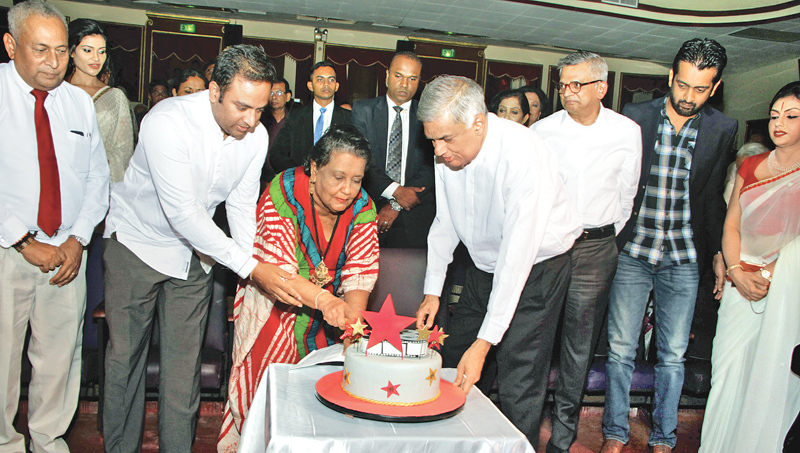 The occasion was the 99th birthday of Rekawa Director, Dr Lester James Peries. 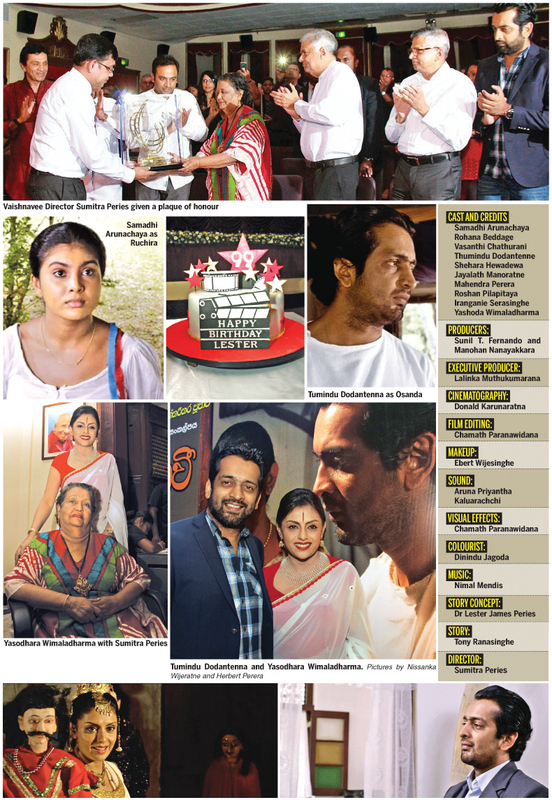 The day was April 5, when Sumithra Peries premiered her latest film, Vaishnavee, as a gift to her iconic husband. The birthday boy was not present on medical grounds. He was too precious to be present, anyway. The mystery begins to unravel following the opening credits. Sumithra Peries enters pre-Independence. She has handled more contemporary subjects, and pre-Independence is mostly her husband’s forte. All the same, this is our opportunity to get immersed in Peries’ filmic indulgence in a different layer. The Vaishnavee script is a collaboration of Dr Lester James Peries and Tony Ranasinghe. The story makes headway with two phases and Osanda (Tumindu Dodantenna of Kumbiyo fame) is in the centre. Both phases point to the rise and fall of Osanda’s romance, though set against two diametrically opposed backgrounds: traditional and surreal. The bridging link is his art: puppeteering and sculpture. Crescendo occurs gradually in the second phase when Osanda’s romantic encounter enters the Pinocchio-inspired magic realism realm. Peries is unsurprisingly reserved where most other filmmakers would have fallen back on more tricks to keep the audience engrossed. The real excitement begins the moment – the climactic point between the two phases – Osanda’s female puppet breathes herself into life. To the viewer, Osanda surfaces as a typical god-fearing young man. But he betrays his innermost passion by sculpting a naked female figure. His foster father (Jayalath Manoratne) shares excitement and a longing thrill, natural for most males, though his female cousin (Samadhi Arunachaya) gets worked up driven by sexual jealousy. The female puppet, sculpted with subtle female curvature, slowly tiptoes into life turning Osanda’s life upside down. Vaishnavee could be called a thriller owing to its nerve-shredding elements. The thriller could be defined to the extent on how the movie has been shot to make you a participant in a tension-filled game only to leave you finally as a confused viewer. The confusion emerges with the beliefs and other kinds of rhetoric associated with village-based superstitions. The celestial beings are truly divine elements devoid of mortal emotions such as anger. If that is so, why does the tree goddess, or the probable representative of Vaishnavee, commits ungodly acts like creating chaos in the ancestral house? Is it a mere driving factor of sexual wrath? If that is the case, the point that Peries attempts to drive home is clear: woman, thy name is jealousy! The conflicting point in the transition from the first phase into the second elaborates why the tree goddess (Yasodhara Wimaladharma) handpicks Osanda. At the very first instance, according to the lady exorcist (Veena Jayakody), the goddess is out on a mission to avenge Osanda who felled the tree which was her abode. But then the next instance, the goddess reveals that she wanted to comfort lovelorn Osanda. Compared to the second phase, the first phase could be given a blanket term: plot-wise junk. But it serves in its own right to the development of the second phase. Plot-wise junk it is, though that is exactly where Peries dazzles as the director. The sequence is an almost flawless visual treatment of the pre-Independence with buggy carts roaming the jungle-like paths, toddy tappers walking the tightrope up above, transparent chemises of the yesteryear ladies and much more. Humans are blessed with the most wondrous things on earth. But they always look for blessings without. How far can a man go in order to feel loved and reciprocate that emotion? Osanda is a naive young man – at least, that is how we are introduced to him – and a nerd immersed in his art too ignorant to understand the simple fact that love is beyond being physical. He was happily talking to the puppets as long as he knew deep down that they are lifeless. Once an inanimate object comes to life, it makes him quieten. It is simply an awed expression of Osanda’s hypocrisy veiled in innocent ignorance. Six-inch-tall Osanda goes speechless a few inches shorter when the celestial being questions what he expects in love. The concluding line, ‘remember, love is a spiritual bond’, is too commonplace, yet the subtext is windblown. With the concluding line, the celestial being departs. That love is a spiritual bond stands out as a cliché we have heard enough - not the underlying philosophy, though. Have we grasped the real hold of love? Or is it a simple, maniacal, selfish expression of our carnal desires? When Osanda seems to realise what the tree goddess tries to call forth, he is too late. But he offers us a chance. The audience is not too late. Step into the theatre. Or better, wander into the balcony. Find a comfortable seat, settle down, ready yourself to breathe in Vaishnavee. Turn off your phone - not even the dim display in the thick darkness - and let the enchantress trespass your territory with her poignant greeting of love. That is Sumitra Peries’ gift to us following a long spell of silence.